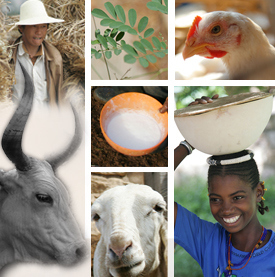 This is the eighth entry of the resilience blog series, written by Mike Jones, who leads the Resilience Thematic Group at the International Union for Conservation of Nature (IUCN) under the Commission on Ecosystem Management. We need to step back from the discussion about the multiple meanings of resilience, how it can be focused and measured, and put resilience building projects into a framework for making sense out of systems. If we do not know, or cannot agree on what kind of system is being managed by resilience building projects, it will be impossible to decide on an appropriate project design. Activities, objectives and indicators will be a muddle of intervention parts that belong to different systems. Snowden’s Cynefin framework (http://cognitive-edge.com/) is a useful way to determine the kind of system being managed and an approach that I used together with Holling’s adaptive cycle and panarchy to make sense out of complexity in community-based approaches to natural resource management (Jones, 2009). 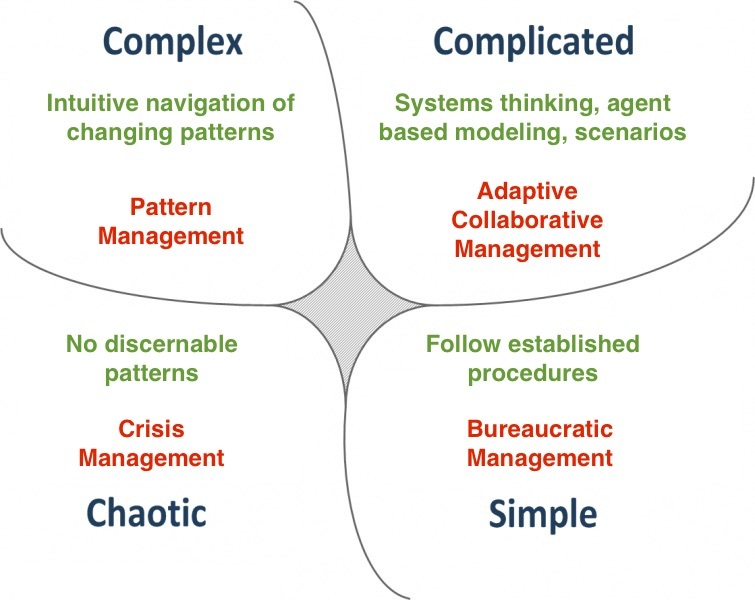 A simple diagnostic tool based on the Cynefin framework to enable project participants to understand the level of complexity of a situation and explore the implications for intervention strategy can be found here http://www.wageningenportals.nl/msp/tool/cynefin-framework. Differences between chaotic, complex and ordered (complicated or simple) systems can be defined by the nature of the interactions between the components of the system (Fig. 1) In chaotic systems there is no relationship between cause and effect; in complex systems cause and effect relationships can only be identified after the event; in complicated systems cause-effect relationships occur but they are not clearly apparent; and in simple systems cause and effect are well known. These simple differences have profound implications for project design and implementation. Fig. 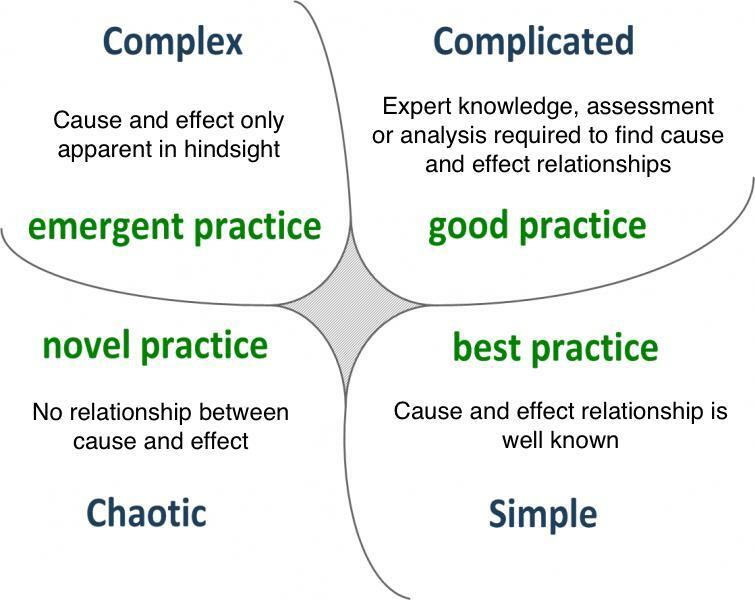 1: Cynefin framework for understanding the cause-effect characteristics of different systems. Problem definition depends on who defines the problem and what they know. Solutions are open ended because of the unlimited interactions between components in open complex systems. Every proposed solution is novel. Solutions are not true-or-false some are better than others. Project designers are placed in a dilemma because they are expected to provide the ‘correct’ solution! Human behavior is inherently unpredictable because of power, agency and cognition. People from different environments and cultural systems have different values and ‘see’ problems and solutions in different ways. Polarization of views and power struggles over what is the right solution emerge unless stakeholders are skilled in negotiation and are able to understand multiple perspectives of the same problem. The level of complexity increases with the level of social scale, making it increasingly difficult for planners to design a manageable project. Mistrust and power struggle occur where unity of purpose is required for successful development. Projects aimed at ‘building resilience’ for food security in drylands are truly complex and cannot be designed on the basis of any assumptions of cause-effect. The implications for project design, management, monitoring and evaluation can be considered in relation to (Fig. 2). Fig. 2: Cynefin framework for understanding relationship between system and appropriate management approaches. Relating project management to systemic order suggests that complex systems are managed intuitively according to the manager’s perceptions of emerging patterns. Driving a car is an act of pattern management and pattern management forms a large part of the approach used by rural people in their daily lives. Project design requires a method for bringing some order to complexity, making it tractable in a formal management system of goals, outcomes, outputs and activities. Adaptive collaborative-management (Armitage et al., 2008) is an approach based on complexity with a growing body of evidence from empirical research that supports theories of organizational and institutional change necessary for effective and flexible local management. The key to good adaptive collaborative management is a process that involves local stakeholders, technical specialists and others strongly invested in the project’s goals, to develop appropriate models of change with objectives and indicators. Tools from complexity science such as resilience assessment, agent based modeling and scenario planning are used to determine the strategic direction of the project. One key difference between tools based on complexity science and traditional cause-effect thinking is the use of causal loop analysis (http://www.isixsigma.com/tools-templates/cause-effect/causal-loop-diagrams-little-known-analytical-tool/); (Dougill et al., 2010) to understand feedback, as opposed to linear modeling that seeks the ultimate cause of a problem. Once strategic direction is determined, conventional logical framework approaches can be used to develop an implementation plan. The plan would acknowledge the uncertainty that arises from complexity, identify key assumptions, be more outcome oriented than output oriented and include qualitative as well as quantitative indicators (Harries et al., 2014). The plan would be implemented by local stakeholders with appropriate technical support, rather than by technical experts. Adaptive collaborative management requires a paradigm shift in traditional environmental management practices from liear thinking to systemic thinking; and considerable local empowerment. Both of these changes have implications for the power of development agents and bureaucrats. Bureaucratic management strives for simplicity and efficiency, complexity demands attention to process rather than product, effectiveness over financial efficiency and quality over quantity. These differences will tend to create tensions and power struggles, as it requires development agents and local people to learn new skills, change established roles and even their sense of identity. Such differences will be difficult to overcome unless the projects and programs are designed within a policy framework that promotes and support the emergence of new organizations and institutions at the local level. Creating paradigm shifts of this kind are the most difficult of changes to create in a complex system (Meadows, 2008) but may be approached opportunistically in incremental steps. Bringing this article back to the matter of resilience, it is important to recognize that resilience is an abstraction that cannot be measured so it makes a poor project goal for bureaucratic management or adaptive co-management. Complexity science views resilience as the outcome of the interactions between the components of a system and the system’s potential for change represented in the stocks of resources that it holds (Meadows, 2008). There are a number of attributes such as spatial heterogeneity within a landscape or social networks within a community that contribute to resilience (Carpenter et al., 2012) and are amenable to the definition of project objectives at the outcome level in terms of both quantity and quality. Project interventions aimed at enhancing general resilience are useful on their own or in combination with projects designed according to a theory of change based on an assessment of resilience of what system (and whom) to what disturbance. Various attempts at defining indicators for resilience in relation to resilience building and food security that I have seen in this series and associated literature suggest an expert driven approach to project design based on linearity, with or without stochasticity. This is being done as part of project implementation, or as contributions to improved design. Donor agencies are attempting to define best practice and maximize efficiency in project delivery with their strong emphasis on objectively verifiable quantitative indicators. Best practice and maximum efficiency are great for simple tasks like process engineering and financial management but it is unlikely that they will deliver the deep changes necessary to support food security in drylands. Armitage, D., Marschke, M. & Plummer, R., 2008. Adaptive co-management and the paradox of learning. Global Environmental Change, 18(1), pp.86–98. Carpenter, S.R. et al., 2012. General resilience to cope with extreme events. Sustainability, 4(12), pp.3248–3259. Dougill, A. J., E. D. G. Fraser, and M. S. Reed. 2010. Anticipating vulnerability to climate change in dryland pastoral systems: using dynamic systems models for the Kalahari. Ecology and Society 15(2). Jones, M.A. 2009. Trying to Make Sense of it All: Dealing with the Complexities of Community Based Natural Resource Management. In B.B. Mukamuri, J.M. Manjengwa, and S. Anstey (eds. ), Beyond Proprietorship: Murphree’s Laws on Community-based Natural Resource Management in Southern Africa. Weaver Press: Harare. pp. 179-197. Meadows, D.H., 2008. Thinking in Systems: A Primer Diana Wright, ed., White River Junction, Vermont: Chelsea Green. Available at: www/chelseagreen.com. Tags: IUCN, Mike Jones. Bookmark the permalink.